When we are engaged in high performance at work, while also managing our home-life, we can fall into eating for quick energy which, unfortunately, does not always translate into nutrition. Eating mindfully for sustained energy is a tremendous gift you can give yourself that will support you in being the best version of yourself. A significant component of the Phoenix-Hearted Woman retreats is the concept of self-care and managing our energy for resilience. Therefore, we include at each of our retreats nourishing food to help us replenish our mental and physical energy and support the maintenance of health. Optional: A sprinkling of hemp hearts (2-3 TBSP) is a nice way to add essential fatty acids (Omega 3 & 6) plus a complete protein (all the amino acids) to your salad. Preheat oven to 375F. Peel and chop the squash into approximate 1-2 inch cubes. Lightly toss with a tablespoon of olive oil or avocado oil and dust with salt. Spread onto a parchment lined baking tray or into a 9x11 inch pyrex glass baking dish and roast for about 20 minutes or until squash is tender when pierced with a fork and lightly toasty looking. It’s a good idea to stir or toss the squash cubes part-way through the roasting. Remove from oven and let cool before tossing with the rest of the salad. 2. 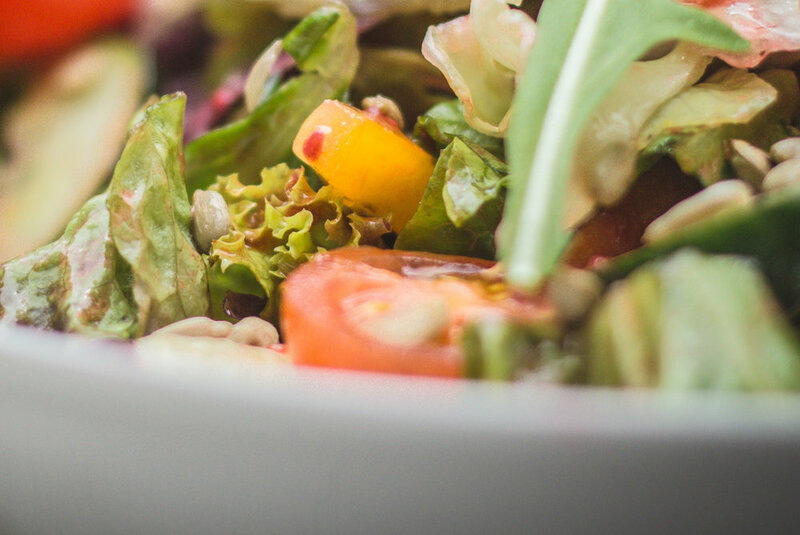 Toss the salad leaves and vegetables together in a salad bowl along with a scant 1/4 cup of the dressing, then sprinkle the pumpkin seeds and optional hemp hearts on top. 1. Simply put everything into a jar and shake it up. If the tahini is too thick, mash it up with a fork. The vinegar should help dissolve the bits of tahini. Fresh cilantro pairs nicely with this dressing--add them together to your salad.